I’ve invested a small amount of test money with Lending Loop and really like it. It’s become a nice complement to my overall investment portfolio. Before we explore everything Lending Loop has to offer, let’s take a closer look at the concept of peer-to-peer lending. Peer-to-peer lending, otherwise known as P2P lending, is a platform that matches lenders and borrowers. Usually offered online, individuals, or in the case of Lending Loop, small businesses, borrow money from hundreds, even thousands of individual lenders, who have pooled their money together. Freed from the high overhead of traditional bricks and mortar financial institutions, peer-to-peer lending companies can grant loans to borrowers at a lower interest rate, while providing better than average returns for investors. 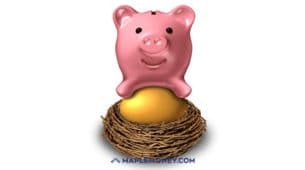 When the loans are repaid in full, the lender gets their principal investment back, along with the annualized interest, which has been repaid by the borrower over the term of the loan. Lending Loop is a Canadian peer-to-peer lending company headquartered in Toronto. 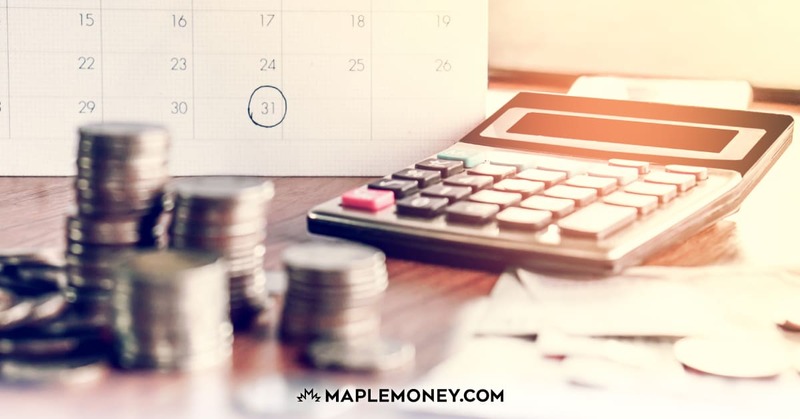 Using an online platform, they provide loans to Canadian small businesses that are funded by individual borrowers pooling their money together. 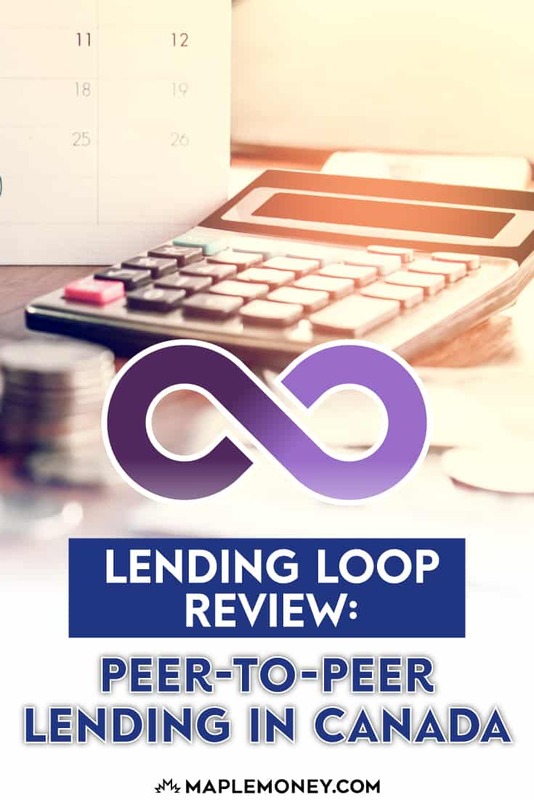 Lending Loop is fully regulated, with a mandate of connecting investors with small businesses that are looking for affordable ways to borrow. It all begins with the borrower. A small business applies for a loan using a simple, online application. 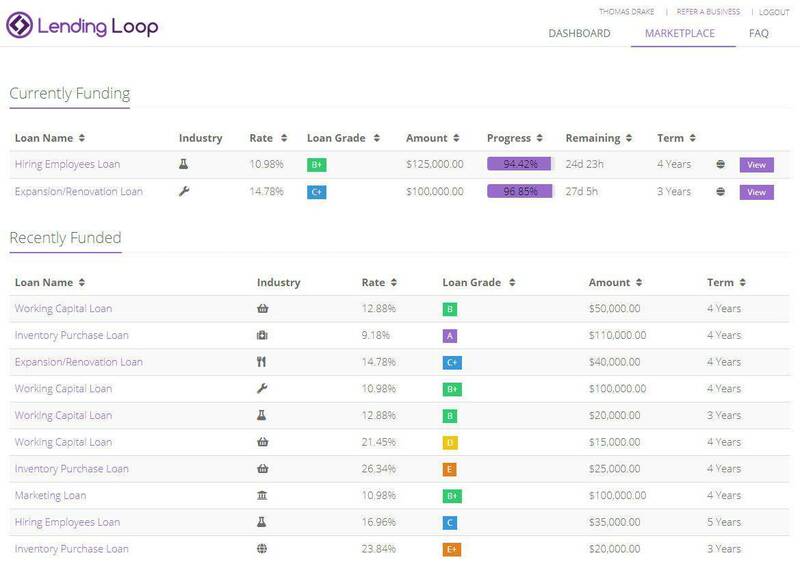 Lending Loop evaluates the application, taking into account a number of factors, such as the company’s financials, as well as their creditworthiness. Once Lending Loop has determined that the company qualifies for funding, their request is placed on the Lending Loop Marketplace (more on that later). Individual lenders can now view the company’s loan request, and decide if they want to lend their money to that particular company. Not all borrowers are equal, however. During the evaluation process, Lending Loop assigns a risk rating to each loan, ranging from A+, for the lowest risk borrowers, to E, for the highest risk. The higher the risk, the higher the interest rate that’s offered to individual lenders. Returns can range anywhere from around 6% to 26%. The loan remains in the marketplace until enough lenders come forward to fully fund the loan. Depending on the size of the loan, the process can take anywhere from a few days to a few weeks, to sometimes not funding the loan at all, and the request being withdrawn. Lending Loop makes the signup process easy for lenders. The first step is to give them the necessary personal information. They will require your Social Insurance Number for tax purposes. From there, you’ll complete a short questionnaire, to help Lending Loop better understand your investment preferences. You then need to make your first deposit into your Lending Loop account, as a transfer from your primary bank account. The minimum investment is $200, but after that, you can invest in increments of $25. 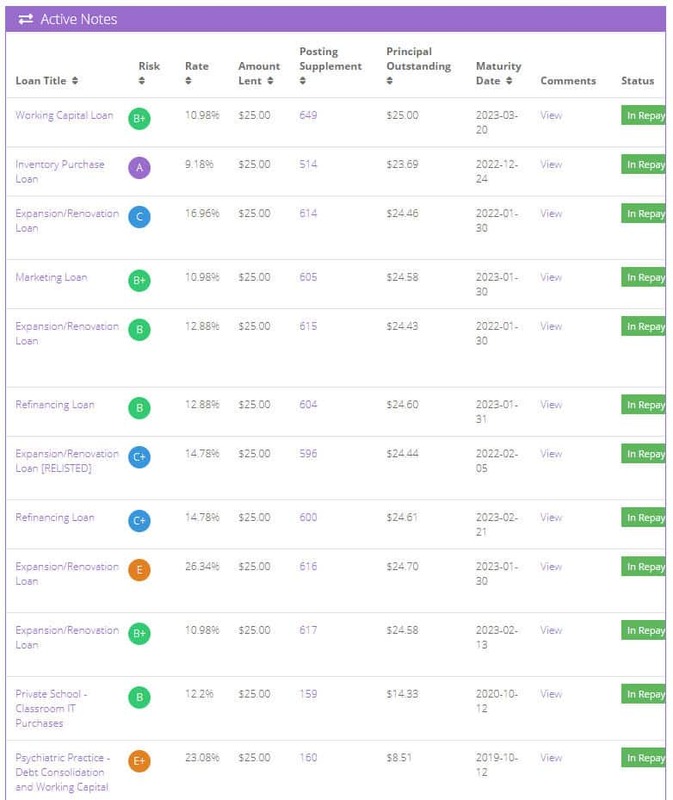 Once everything is confirmed, you can begin perusing available lending opportunities in the Lending Loop Marketplace. This is when you can also set up the Auto-Lend feature, which automates the process. I’ll explain Auto-lend in further detail below. Open A Lending Loop Account Today! According to the Lending Loop website, all funds deposited are held in trust with a Canadian Chartered bank, and funds are transferred using the same secured networks that your bank uses. Peer-to-peer lending is considered a mature industry in Canada, and it is regulated. In fact, a few years ago, Lending Loop voluntarily made changes to how they were organized, in order to meet the highest possible regulatory standards. As far as the investment itself, there is always some risk involved. The money you lend out is not guaranteed and could drop in value. But this is no different than a lot of investments. The important thing is to stay within your risk appetite. Lending Loop makes it possible to diversify by lending to companies of various risk levels. This can help to mitigate your risk. As I mentioned earlier, I’ve been investing with Lending Loop for a while now. I’ve attached screenshots from my very own Lending Loop portfolio below, to show you how all of it works. 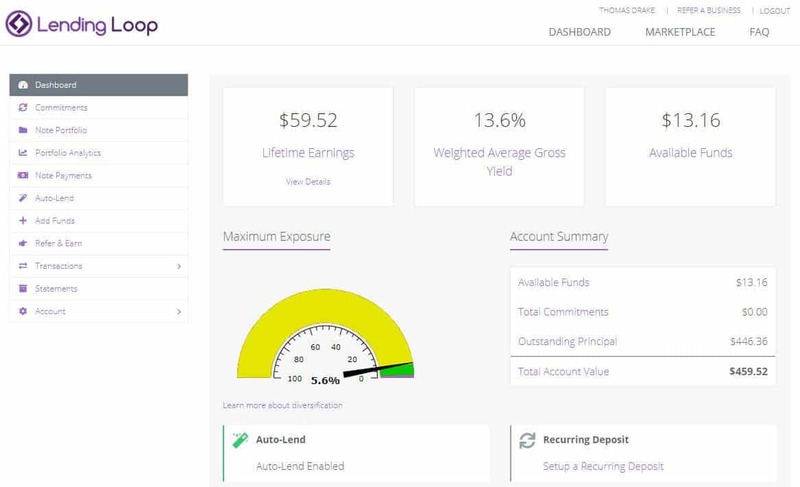 The Lending Loop Dashboard allows you to view the details of your overall investment in a single glance. The dashboard below displays my lifetime earnings ($59.52), the average gross yield of my investment before fees (13.6%), and the amount of funds I have available to lend ($13.16). While I’ve only deposited a small amount as a test, with an average double-digit return, you can clearly see the investment potential. There is also a comments column, where lenders can view more details specific to the loan, and the borrower. The Portfolio Analytics screen contains a wealth of data that provides insight into a lender’s overall portfolio. The following screenshot displays the percentage I have invested in each risk category, from A+ to E. In my case, more than 50% of the money I’ve lent is to businesses with a risk rating of B or higher. This gives a clear indication of the risk level of my portfolio, and lets you see a breakdown of the portfolio by repayment period, industry type, even geographic location, which you can see in the final diagram. To find a small business to lend money to, you need to head to the Lending Loop Marketplace. This is where all approved loans are listed for potential lender’s to view. There is a wealth of information located here, including the purpose of the loan, the industry, as well as the interest rate being offered, as well as the corresponding risk rating. You can even see the full loan amount, and the scheduled repayment period (term). Like any investment, it’s important that you do your research. Ask yourself, is the company in an industry you feel is solid and does the repayment term align with your investment time frame? After all, the funds you lend won’t be returned to you until the loan is paid in full. Auto-Lend is the feature I use to invest with Lending Loop. Auto-Lend automates the lending process, by allowing you to make regular contributions using pre-set criteria. As you can see in the image below, I have Auto-Lend set up to invest $25 at a time into any risk class. I can adjust the amount I contribute, as well as the risk I’m willing to take on. Auto-lend comes in handy if you want to keep things simple and make sure you’re properly diversified. The fee structure at Lending Loop is very straightforward. Lenders are charged a 1.5% fee, which is taken from the total return. For example, if you’re investing in a loan providing a return of 7.0%, your net return would be 5.5% after fees. All things considered, this is a very reasonable price to pay for a fixed income investment with the potential to provide a far better return than any GIC. For the borrower, there is a one-time setup fee that ranges between 3% and 6.5% depending on the risk rating that’s assigned to the business. This is no different than most banks, who usually charge a setup fee for small business loans. Some even charge an annual review fee. With Lending Loop, borrowers only pay the setup fee after the loan is approved and they have received the funds. The fee is deducted from the loan proceeds at the time of funding. Such is the beauty of peer-to-peer lending. Because everything is done online, companies like Lending Loop incur far less overhead and can lend money at a lower cost than traditional financial institutions. In my opinion, the fees you’ll pay with Lending Loop are reasonable for both the lender and the borrower. If Lending Loop needs to take action to collect payments from a borrower, they may need to charge a collection fee to offset the costs associated with the collection of funds. If this were to happen, the collection fee could be taken from the funds a lender receives on repayment. Lending Loop makes it clear that they would never debit a lender’s account for this fee, and if funds cannot be collected, no fee would be charged. This is something to consider, however, especially if you’re lending money to a high-risk borrower. Ease of use – Lending Loop is only available online, meaning that you can lend, or borrow, from the comfort of your living room. The convenience is hard to beat. Low point of entry – You can begin lending money for as little as $200 through Lending Loop, and subsequent contributions can be made for as little as $25. Attractive returns – Lending Loop offers investors the potential to earn rates of interest they could only dream about in a GIC through their bank or credit union. Free to join – Lending Loop is completely free to join. If you’re interested in signing up just to see how everything works, you have nothing to lose. You’re supporting Canadian small business. Not everyone cares about this, but it was definitely something that appealed to me when I invested my money with Lending Loop. Investment risk – While Lending Loop is fully regulated, there are risks to investing in the fortunes of very small businesses. That’s why interest rates on the lowest quality loans are as high as 26%. Make sure you stay within your risk profile. Lack of liquidity – The Lending Loop marketplace isn’t like the stock market. You can’t just sell and get out at any time. Your funds are only fully available after the loan is repaid. That could be in as little as a few months, but it could also be a few years. Make sure you can lock your money in for the required time period. Is Lending Loop Right For You? Now that you know more about peer-to-peer lending and Lending Loop, you may be trying to decide if it’s right for you. Here’s my take. If you’re looking for ways to make more money on your fixed-income investments, you may want to consider investing a small percentage of your portfolio with Lending Loop. After all, you won’t get very far with GICs paying 1-2% interest. Investing with Lending Loop will increase your potential for return, and it can be a lot of fun. The important thing is to stay within your risk tolerance. If you’re unsure, you could always take my approach, by opening an account, and investing a small amount of money as a test, to see how it goes. I have very similar conclusions to you with my experience on Lending Loop. One thing you didn’t talk about too much is the loans that are late, and in default. I have been lucky in my account and do not have any delinquent loans, yet. The Accountant and Economist do have delinquent loans and that’s really going to hurt their returns. I’ve changed my auto-lend to only A,B,C quality in the hope of trading some return % for reliable borrowers. It can not be stated loud enough the risk, and lack of liquidity. However, I’m happy to set it and forget it auto-renewing with new loans as the cash comes in monthly. But, I’m only playing with a relatively small $. One also should consider the tax consequences of interest income vs. Canadian dividend stocks. All things considered though, it is ‘fun’ and I do appreciate that there are other niche opportunities in Canada available to average investors. There’s money to be made lending money that’s for sure! Can you please confirm, I’m from Quebec City,Quebec and from my understanding we would not be able to join Lending Loop as a lender. I have been investing with Lending Loop for just over one year now. My plan was to invest a set amount of capital for a 12-month term and then analyse the performance before deciding if I would continue my involvement. I invested an equal amount in 80 different companies (all risk bands) to reach the maximum principal I desired. Then I continued to invest in new companies to maintain the same level of principal. After one year, my net return (after adjusting for Defaults/Delinquencies) is only about 2%. This is calculated from a gross return of 14% less the 1.5% fees and about 10% for losses. My average loan risk is rated a C+, so it’s not exactly the worst of the worst. In fact, most of the delinquent loans are in the B risk category. To make things worse, I am a 15-year commercial banker so I’m either really bad at my job or Lending Loop is really bad at theirs. Either that, or all the other online reviewers are overly optimistic about the recovery rates on delinquent loans. But I’ve been in the business long enough to know that you rarely recover the full amount (if any). Once they go delinquent, you might as well write them off. Even if I add back a reasonable recovery rate, I doubt my annual return would exceed 5% (This is far short of the net 8% that I was hoping for). I sent Lending Loop an email about their historical recovery rates but I never received a response. Since my 12-month trial period has passed, I have made the decision to cease any further investment into Lending Loop and am allowing my remaining principal to amortize down to zero. I am not convinced they are doing a good enough job with their Credit practises. This is supposed to be high risk lending but nobody is going to invest if the returns aren’t there. On that note – I would recommend Lending Loop to a Borrower, but not to an Investor. Unfortunately, the web platform can’t exist without both.